Well, it took me long enough to post again here. Mea maxima culpa. We said, "Good-bye," to our unique fruit-stand-turned-gallery the Art Stand Gallery in Minkler, and we said, "Honey, we're home!" at the Sanger Art Station in downtown Sanger. When we first moved, our space faced P Street. We have now for a month been in another suite, much more visible to the main drag of downtown, right on 7th Street. Our members now are: painter Deanna Sue Bristow, painter Chieko Delgado, potter Elaine Towne Lane, painter Kay Owens, and potter T.S. Wood. Plus Bob Owens, Kay's beloved, has a small section in the gallery for his very unique horseshoe nail table sculptures. Some of us also do jewelry on the side, so if you're looking for interesting little wearable adornments, we have quite a variety of jewelry pieces, as each person has a different style. 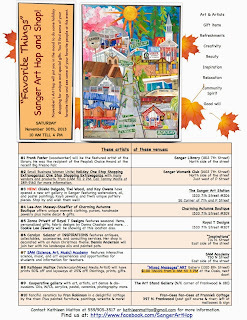 On the last Saturday of the month, we participate in the Sanger Art Hop. This month's Art Hop will be a week from tomorrow, 30 August 2014. During Art Hop, we are open an hour early. So come and see us next Saturday between 10am and 4pm. We'd love for you to see our new place, filled with beautifully artistic pieces, many of which are new works that were created after the move, like this gorgeous seagull by Deanna. In the meantime, have a wonderful rest of the summer. Stay cool. Blossom Trail Greetings To You All! I must apologize, again, for not having been diligent with posting. I must say that ever since I set up a Facebook page for our gallery, I have been more active there and much less here. Please visit our page and click "Like" so that you get regular gallery updates. Click here to visit. There are several items that I need to bring up in this post. A couple of exciting ones, and a sad one. I'll save the good ones for later and start with the sad one. With heavy heart we make the announcement that this Blossom Trail season is most probably our very last season at our current location on Hwy 180 and Frankwood Avenue in Minkler. This is due to circumstances beyond our control. Come and visit us on Wednesday-Sunday, 11am-5pm, until the 27th of April, 2014. 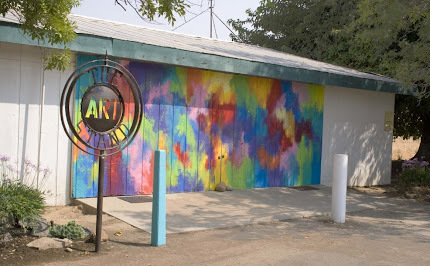 The first exciting bit is this: some of our members have opened up a new gallery in downtown Sanger called Sanger Art Station﻿ (on 7th and P #206), in preparation for the closing of the Minkler location. Our hope is that once we have vacated the ASG in Minkler, we will all join up again at the Sanger location. Please check out and "Like" the new gallery page on Facebook as well. Click here to visit the page. Our "Blossoming!" themed tree to greet our guests at the downtown Sanger location. The second exciting bit: PARTY! We would like to invite you to our reception for our last season this Saturday, 1 March, from 11am to 5pm. Please come and see all the beautiful art works on display at the gallery. Perhaps some of them already have your name on them. 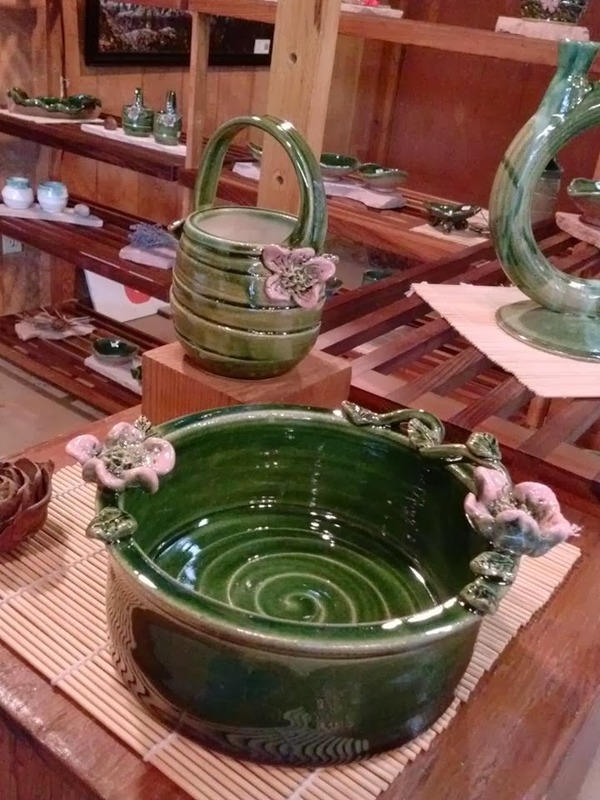 T.S.Wood's Blossom Trail inspired pottery. 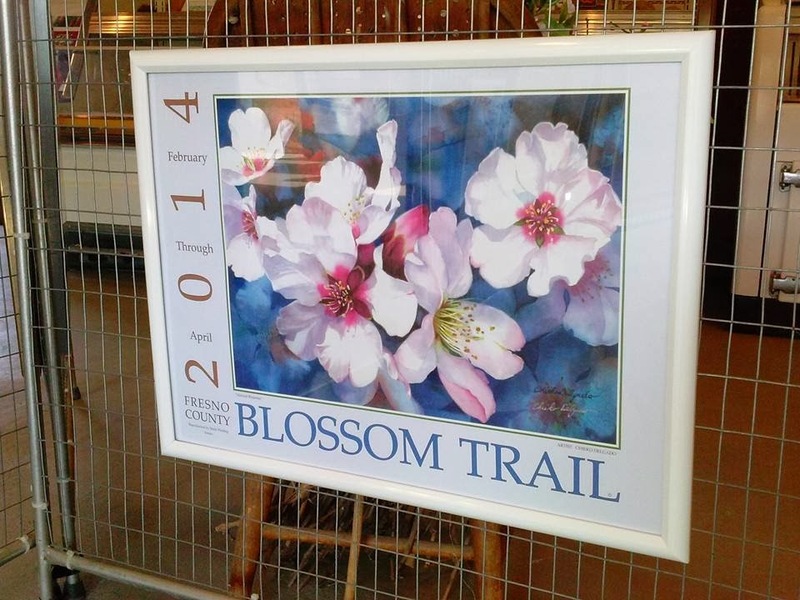 The third exciting bit, if you haven't heard already: our own Chieko Delgado is the 2014 Blossom Trail poster contest winner! 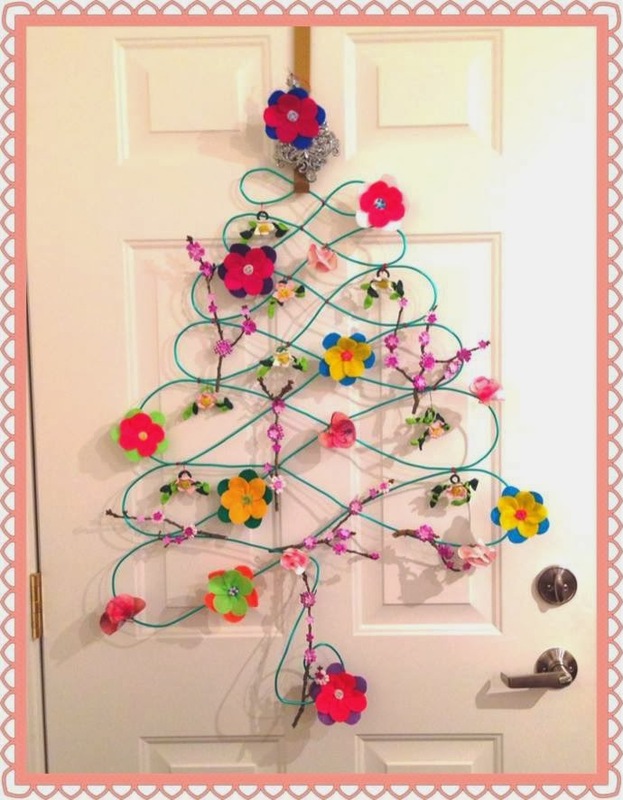 This is her second win for the Blossom Trail poster contest. Her beautiful posters (signed and unsigned) are available at the gallery. Come and see us. Weds-Sun, 11am-5pm. We thank all of you who have been our great supporters and dear friends, and we look forward to seeing you, repeat visitors and new ones alike, this Saturday and throughout this spring. I'm sorry to have neglected to send you a Christmas wish yesterday. It was a festive day filled with good cheer, a day of thanksgiving for all the blessings, large and small, in my life. My prayer is that yours, too, was merry and bright. 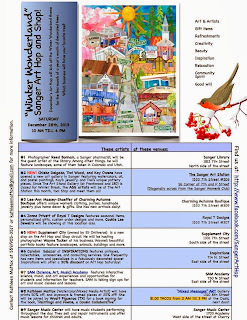 But now that the Christmas rush is over --I hope-- it's time to remind you of the December Sanger Art Hop. The gallery is closed for the season, but we would not want to miss this fun December Art Hop. 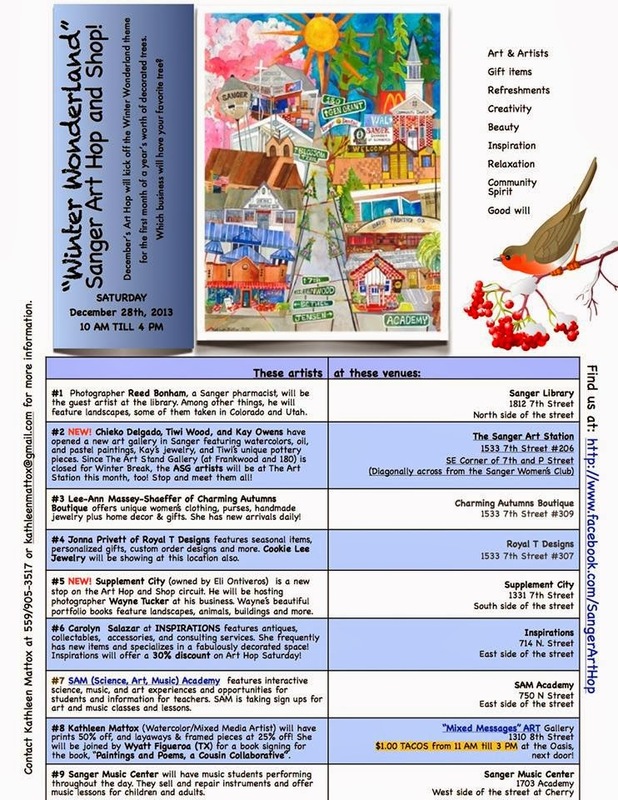 So we decided to meet you at another location, in downtown Sanger, at the Sanger Art Station, where Deanna Sue Bristow, Chieko Delgado, Kay Owens, and I have set up a small gallery, beginning with the November Art Hop. It is on 1533 7th Street #206 (corner of 7th and P Street, caddy-corner from the Sanger Women's Club). The hours are 10am to 4pm. And if you've never been to downtown Sanger, I'd like to suggest that you wear some comfortable walking shoes because these Art Hop locations are within walking distance from each other. It's quite a pleasant thing to walk in downtown Sanger, and there are places to stop for lunch. Of course, the Sanger Art Station will provide hot cocoa and marshmallows, along with some nice dainties. 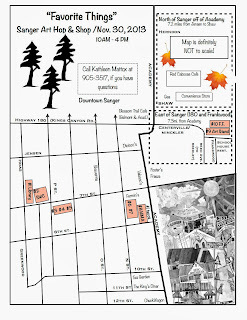 Here's the list of participating December Sanger Art Hop locations that Kathleen Mattox has prepared for us. Click the image to enlarge. 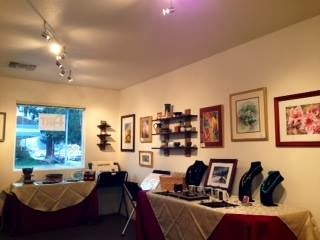 Hope to see you at the Sanger Art Station. This is just a to remind you that our gallery will only be open until the 15th (this coming Sunday) this year. We'll be on our Christmas vacation until it's time to reopen in early February for our Blossom Trail season. 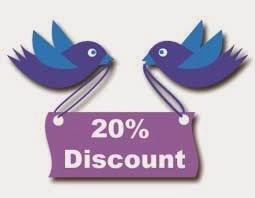 And there is a 20% discount on all sales until Sunday. If you haven't had time to come in yet, please do. We are open from 11 am to 5 pm. 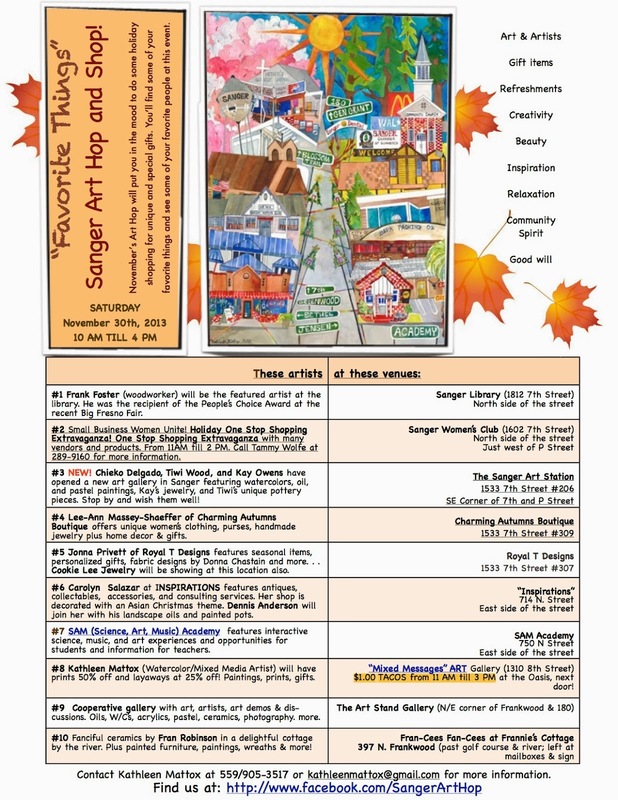 This Thanksgiving Saturday is Sanger Art Hop day! And how exciting that there will be 10 --that's TEN!-- locations for you and your visiting family members and friends to visit in one artistically exciting day. Check out these posters (click pic to enlarge) that Kathleen Mattox has prepared, including the map of the ten locations. Beginning on Art Hop Saturday until our last day of operation on 15 December, our gallery is offering a 20% discount on all of our art works. This brings you the reminder that we will be closed after that mid December day for our Christmas break, and we will reopen for Blossom Trail in early February 2014. On another exciting note, yours truly with fellow ASG members Chieko Delgado, Kay Owens, and Deanna Sue Bristow are opening another gallery in downtown Sanger, called Sanger Art Station on P Street and 7th Street, suite #206. This new place has been added to the growing list of Sanger Art Hop participants. We are NOT leaving this beloved ASG, oh no, not us! But this new gallery will soon provide us with the opportunity to bring to our faithful patrons our works in another location, while encouraging more Valley residents to find more artistic options to beautify their lives and homes with. Please find us on Facebook and click "Like". Here is our FB address https://www.facebook.com/SangerArtStation . We will welcome old friends as well as new on the November Art Hop day, which happens to be Small Business Saturday as well. Our creed is "Shop local!" We hope to see you at the Art Stand Gallery in Minkler in this season of mirth. Amidst the busy preparation for a festive Thanksgiving, remember to take a breather by stepping inside our place and enjoying a relaxing moment among our lovely art works, Wednesday through Sunday, 11am to 5pm. This week we are closed on Thanksgiving day so that everyone can enjoy a wonderful day with loved ones. Have a fun week of Thanksgiving preparation, folks. Remember to pencil in Sanger Art Hop this Saturday on your calendar. Shop local! Saturday, 26 October 2013, which is tomorrow, is the last Saturday of the month. Yes, ALREADY! And that means it's Sanger Art Hop Day! Last Saturday we moved into the Holidays Season, so when you come in, expect to see lovely winter scenes in many of the art works in our gallery. We'll be open at 10am. Come on over, and enjoy. 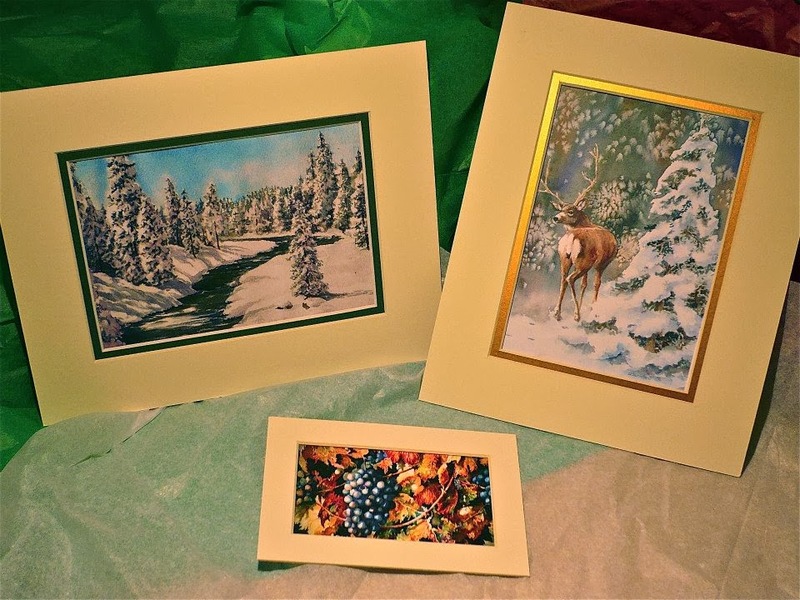 A nice selection of Deanna Sue Bristow's watercolor. We are looking for new members for our gallery, for the period between the Holiday Show (19 Oct-15 Dec 2013) and the end of the Fruit Trail season (beginning of July 2014). Please email me T@Q23.US to find all the details. 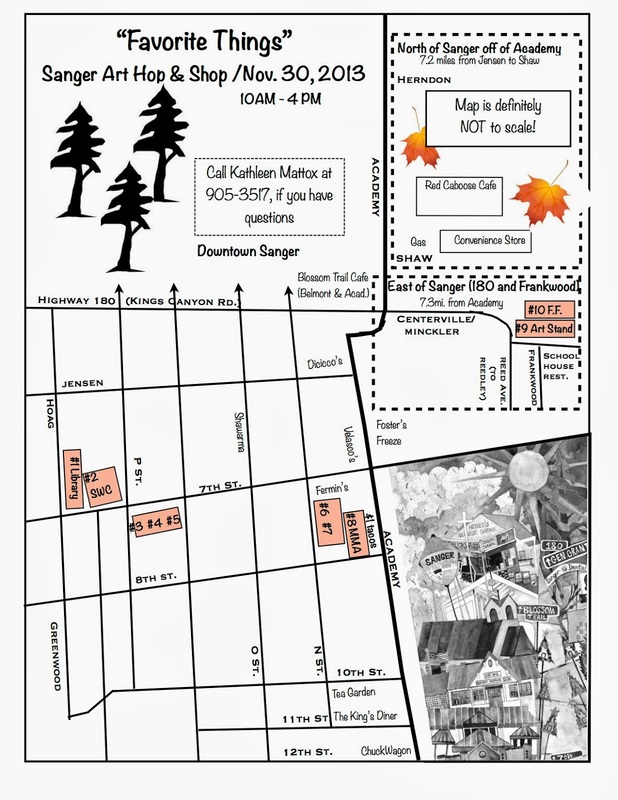 We are located in Minkler at the foot of Jesse Morrow Mountain, below Squaw Valley, past Centerville. We are directly across the School House Restaurant, on Hwy 180 (Kings Canyon Rd.) and Frankwood Ave. Besides the very busy restaurant, there is also the Cedar View Winery/Sequoia View Bed and Breakfast a mile south. Click on those names to get to their websites. Interested? Please contact us ASAP. Our new season is about to begin. Or do you know of any local artists who might be interested? Please forward them this blog. Thanks beforehand. Elaine's pretty horses, Simmie and Winnie. In the meanwhile, enjoy the nice weather by driving to our gallery and be captivated by our art works. We are open Wednesday to Sunday, 11 to 5.